BAKE tortillas in single layer on large baking sheet in preheated 400ºF oven for 7 to 10 minutes or until crispy. HEAT half of the butter in large nonstick skillet set over medium-high heat until just melted. For Sunny-Side Up, Over-Easy or Over-Hard Eggs: BREAK 4 eggs and slip into skillet 1 at a time. Immediately REDUCE heat to low. SPREAD warm refried beans evenly over tortillas. SPOON tomatillo salsa over half the tortillas and tomato salsa over remaining tortillas. TOP each tortilla with 1 fried egg. 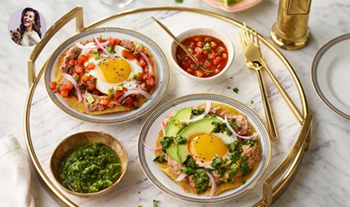 TRANSFER one of each salsa-topped tortillas to 4 plates and garnish with red onion and cilantro. Serve immediately. Mix 1/4 cup sour cream with juice from one fresh lime juice and drizzle on top of eggs right before serving. Garnish with chopped avocados and lime wedges. Prepare recipe with refried black beans instead of the pinto beans if desired. This recipe is an excellent source of vitamin A and iron and a good source of potassium, calcium and vitamin D.